Cheese-wheel pasta has been described by food bloggers as a “melted cheese renaissance” of sorts after the fondue craze of the 1960s. 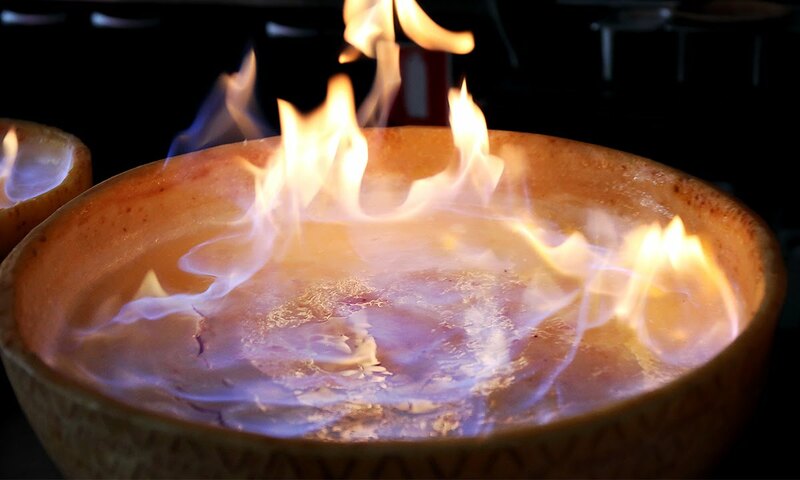 Warmed brandy is set alight and flambéed inside a semi-hollowed wheel of cheese (usually Parmigiano Reggiano). Al dente pasta and sauce is then tossed into the wheel, coating the pasta in cheese and infusing the sauce with a slight hint of brandy. It is a signature dish in restaurants across Italy, America, Hong Kong and Singapore, and has made its way to Adelaide with the opening, first, of Godi La Vita in Hyde Park and then Café Settebello in Newton and Norwood. The concept has proven so popular that Godi La Vita recently added two additional cheese wheel items to its menu, while Café Settebello is planning to introduce a new cheese wheel with a risotto base. “It’s all a concept of theatre,” Godi La Vita owner and head chef Federico Godi tells InDaily. “It’s something that’s done in places where they make the cheese – for example in Rome they use Pecorino cheese. 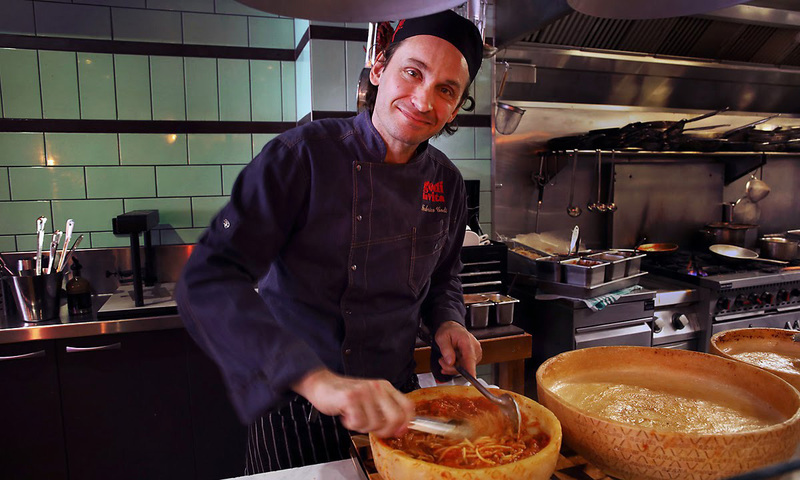 Federico and his wife Laurie opened their King William Street restaurant 17 months ago, at the time boasting the Parmesan fettuccini cheese wheel as their star dish. “People kept on coming in and saying how much they loved it, and then they would bring their family and friends in as well,” Laurie says. The Pecorino cheese wheel has a sweet/savoury taste, with Strozzapreti pasta, pear, walnuts, balsamic vinegar and cream. The Piave cheese wheel is used to cook spaghetti, pancetta, garlic, chilli and prosciutto. Diners are regularly invited to stand next to the kitchen to watch as Federico tosses the pasta in the flaming cheese wheels, creating what he describes as a “family feel” to the restaurant. “You’re not in a restaurant where all you see are walls and furniture; you see the kitchen moving,” the head chef says. Café Settebello in Newton and Norwood also boasts cheese wheel pasta as the signature dish on its menu. Since opening a Newton café in July last year, and expanding to Norwood in September, the Italian restaurant has served the “Settebello Tableside Cheese Wheel” made with brandy, house-made fettuccini, fried mushrooms, stracchino cheese and a cream sauce. Owner Tony Rocca says he originally saw the cheese wheel pasta trend while holidaying in Italy. “I saw it in Italy with my family and we all thought it was amazing. The restaurateur, who also owns Schnithouse on Rundle Street, says a “huge amount” of diners have ordered the cheese wheel pasta since Café Settebello opened. “We serve our cheese wheels at the table. We wheel it out on a trolley and serve it tableside and the customers really enjoy that. “I’d say nine out of 10 people take photos when we wheel the trolley out to the table. Rocca says a second cheese wheel pasta – this time with a risotto base – will be introduced along with a new menu in three weeks’ time.